Last year when we got beets every week from our CSA, I had to find something creative to do with them. I happened upon Weelicious’ Red Beet Pancakes recipe, and though it sounded a bit gross to me, I took a chance because really, we were running out of ways to use up the beets. Surprise, surprise, the recipe was a hit and quickly became Cuddlebug’s favorite. 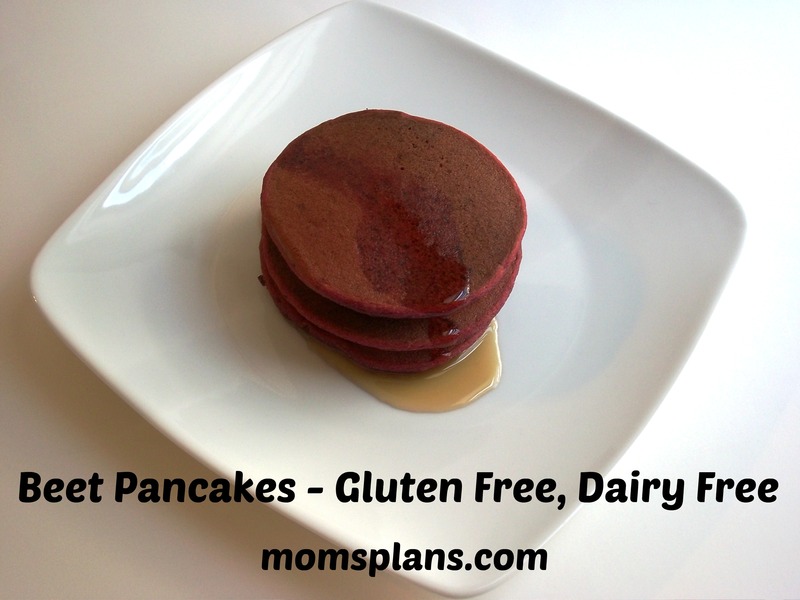 But then we went gluten free in January, and I thought our Beet Pancake days were done. . .until hubby and I got to work revamping the recipe to meet our current dietary restrictions. Cook the beets, covered, in a 400 degree oven for 30 to 45 minutes until tender. Let cool, and then peel. Blend the beets and the water together in a food processor until the beets are just small chunks. Add the eggs and coconut oil to the food processor, and process all until smooth. In a separate mixing bowl, mix together the flours, baking powder, baking soda and brown sugar. Stir until combined. Add the contents of the food processor to the flour mixture and blend. Slowly add the milk and stir until smooth. Makes 24 to 30 small pancakes. it looks great! I have seen beet cakes and other sweet recipes, I have to say it seemed strange at first but a great way to substitute less healthy ingredients.